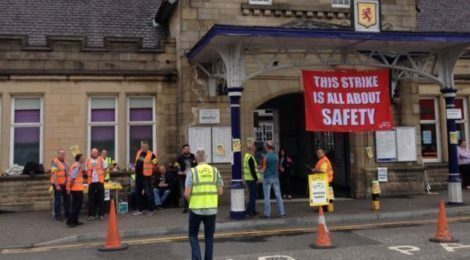 The Edinburgh Branch of the IWW extends our solidarity to Scotrail workers and RMT members across Britain over the issue of Driver Only Operated (DOO) trains . We support this strike on the principle of an Injury to One is an Injury to All. The move to DOO trains will mean that without conductors, drivers cannot ensure the safety of passengers and further , drivers are put in a more risky and dangerous position themselves. Clearly Scotrail and other train companies across Britain are putting profit before safety, describing this move as “competitive” and “modernisation” and looking behind the rhetoric we can see that this is an attempt to open the way to future attacks on jobs and conditions. This attack, this putting profit before people is in essence no different from the 19th century workhouse-like conditions of Sports Direct warehouses or the recent cuts in hours and pay for retail workers with the increased Minimum Wage. All we can learn from these instances is what should be by now plainly obvious- that the working class and the employing class have nothing in common. Our interests are not just different but opposing factors within society.